The city of London, Canada has partnered with Hear, Here, an audio interpretive sign project founded in La Crosse, Wisconsin. Together, they are setting up the first Canadian Hear, Here project. 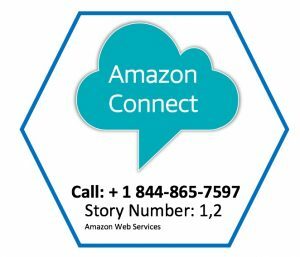 This blog post describes the project, which is built on Amazon Connect, the self-service, cloud-based contact center service from AWS. It then shows you how to build your own do it yourself (DIY) audio tour. Hear, Here collects stories and voices of London’s past. It then delivers them in bite-size audio clips associated with historical and cultural sites around the city. People who call the phone number on a Hear, Here interpretive sign can hear a story that happened at the location of the sign. 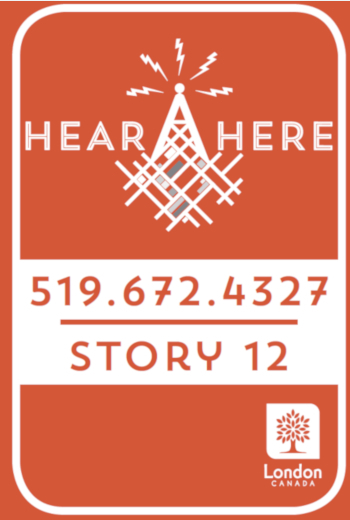 The city will display Hear, Here street signs in three London, Ontario, neighborhoods. Each sign has a story number printed on it (STORY 3), along with a phone number to call. A passerby can call the phone number, and enter the story number that is printed on the sign. They hear the narrative of an event that happened on that spot, in the voice of an original participant. Imagine filling neighborhoods with stories. When you know the stories of a place, a simple stroll becomes a journey for the imagination. Finally, after a listener has heard the story, they can stay on the line to leave their own story of that location or any other location in the neighborhood. If it fits the objectives of the project, then the story is added to the project with a new sign. Otherwise, it can be added to an existing sign location. In this way Hear, Here is responsive to users and becomes community-generated. Pedestrians must be able to call the number printed on the sign (STORY 3). Then the phone system must welcome the caller, and direct the caller to enter the number of the story that they wanted to hear. (“Please enter a story number”). Entering a valid story number on their keypad should play the corresponding story. Adding stories and linking stories together should be comprehensive. This is because the project library would be maintained by university or high school students, neighborhood associations, city heritage boards, or any other arts and culture venue. Implementing the automated IVR should be comprehensive for non-technical users. It should be possible to build it quickly. Implementing a voice mail functionality that lets callers become part of the project. Limiting the costs and avoiding upfront payments. In the public sector, bringing new services to the community based on telephony interactions is sometimes difficult to implement. For instance, you have to design the system for the high-water mark of users and pay for it all upfront. There is also integration of many infrastructure components, which adds complexity to the design and causes delay in implementation. So how can you deploy all of this in a short timeframe and on a tight budget? 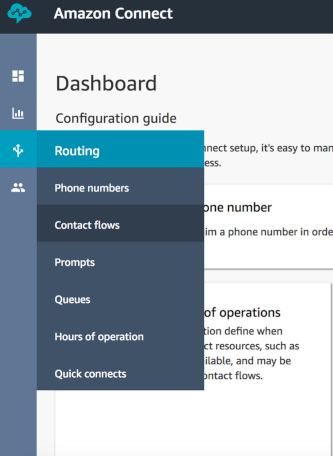 Enter Amazon Connect, the AWS self-service, cloud-based contact center service. It makes it efficient for any business to deliver better customer service at lower cost, with no specialized skills required. Check out this blog post if you don’t believe us: So easy, an eight-year-old can use it. 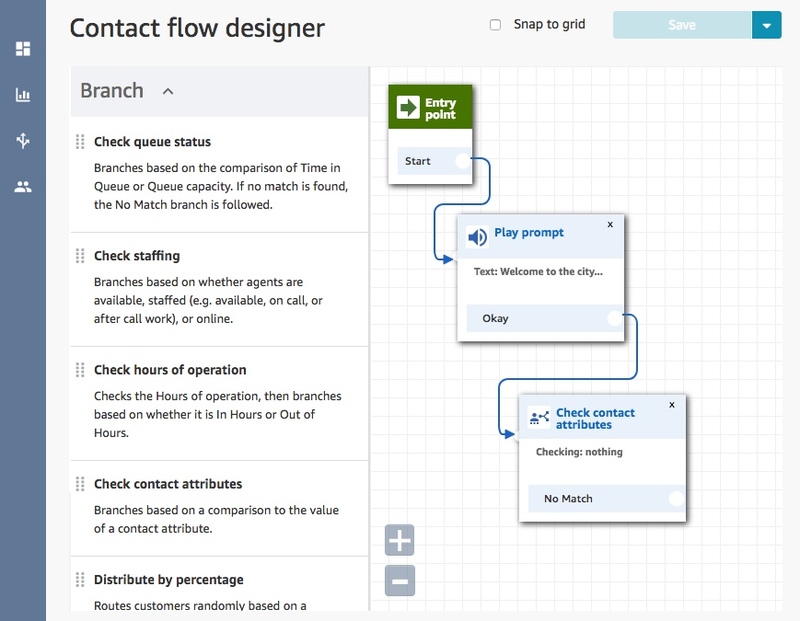 To build the contact flow, you must get your environment ready. First, log in to your AWS account. Create an Amazon Connect instance, if you haven’t done so already. For more information, see Amazon Connect – Customer Contact Center in the Cloud. The AWS Free Tier lets you gain experience with the AWS platform, products, and services. Use an AWS Lambda function to dynamically fetch the recording to play to the caller. 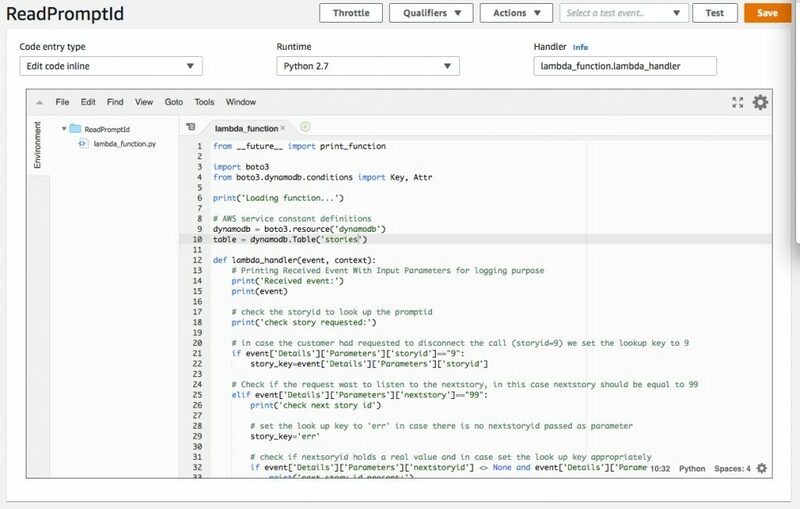 AWS Lambda is a serverless compute service that automatically runs your code without requiring you to provision or manage servers. For more information about Lambda basics, see this AWS Lambda tutorial. Finally, use Amazon DynamoDB, a fully managed NoSQL database (key-value and document database) that delivers single-digit millisecond performance. For more information, see this Amazon DynamoDB tutorial. 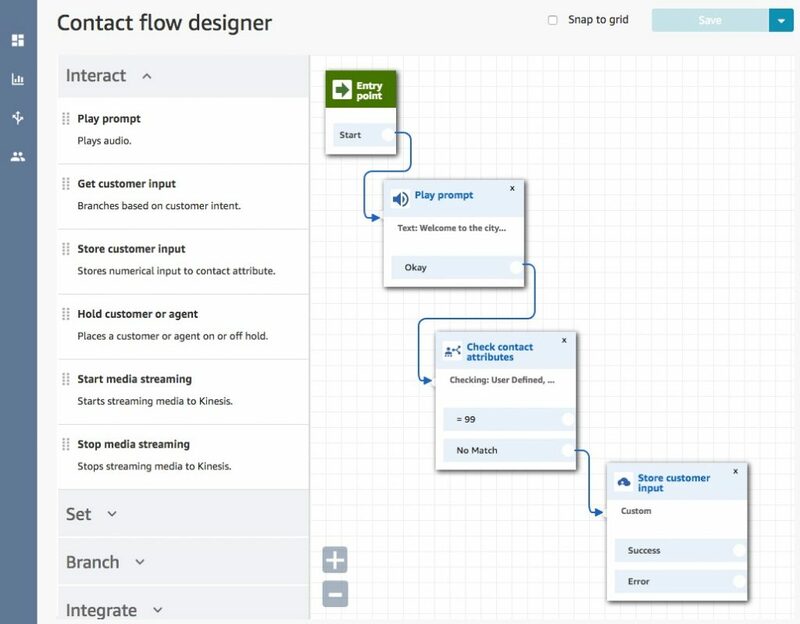 Now that you have the basics, you are almost ready to build your first contact flow. But next, upload your library of recorded stories. Make sure to keep your design efficient. 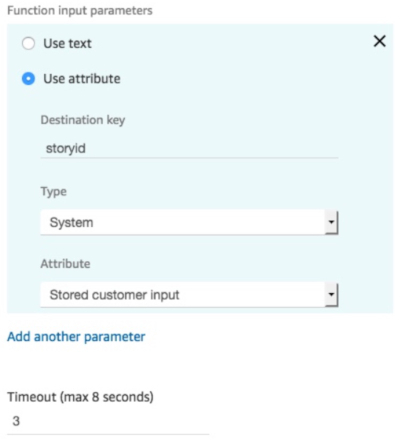 This includes scaling and linking stories by creating a supporting Amazon DynamoDB table and AWS Lambda function to dynamically retrieve the story recording. Open your Amazon Connect instance. In the left pane, choose Routing, Prompts. 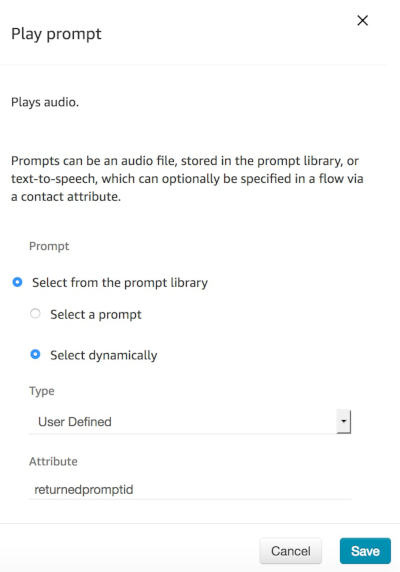 Create your prompts by recording your voice or importing any audio file that you would like to play. You can also browse from a drive attached to your PC. Only 8 KHz .wav files that are less than 50 MB are supported for prompts. In Step 1: Upload or record your prompt, choose the Upload tab. Choose the file that you want to upload, got to Step 2, and enter the name of your prompt (for example story_1), and choose Create. Repeat steps 3 to 6 in this section to create a prompt for every file that you need in your library. Your audio files, or stories, are uploaded. Take note of each story Prompt ID to complete the next steps. Paste the Prompt ID into a text file. Also include the unique code that you want to assign to the story (for example, 12345). This code is needed later. 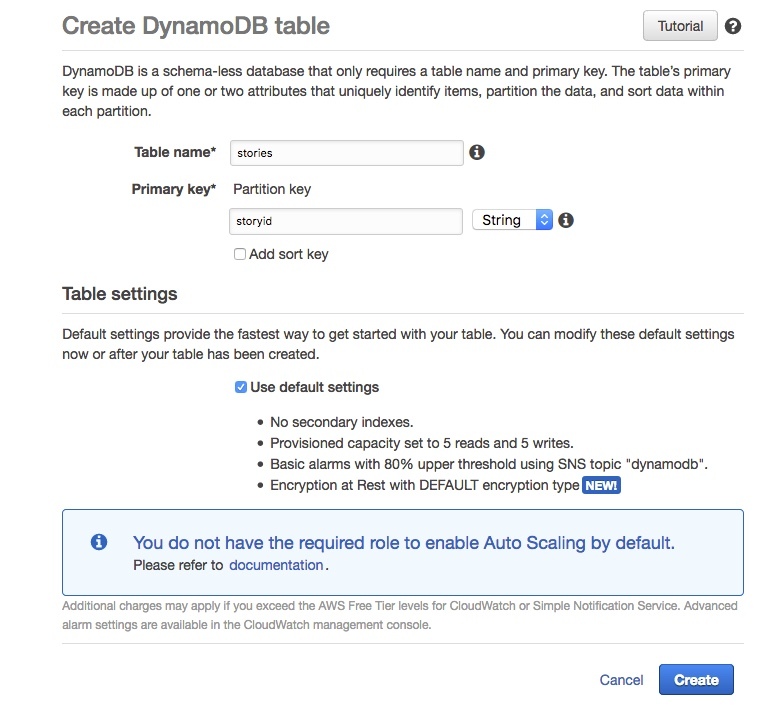 Now create an Amazon DynamoDB table to store all of your story codes. This includes their Prompt ID and the code of the next recording that needs to be played if the caller asks for more. For Table name, enter stories. For Primary key, enter storyid. Leave Use default settings selected, and choose Create. After creating the table, add the story codes that you uploaded. Choose stories, then choose the Items tab. Enter the story code; for example, 12345. 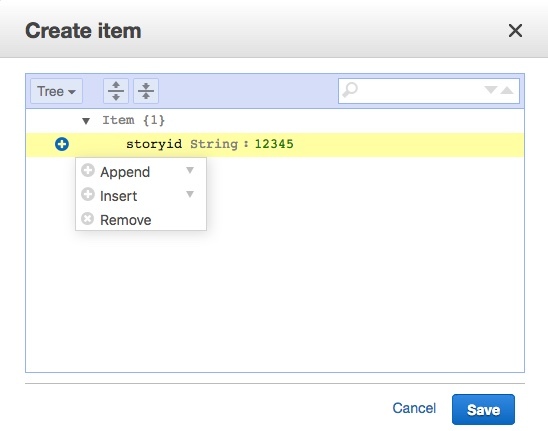 Choose the “+” sign to the left of your storyid, choose Append, then choose String. In the FIELD box, enter promptid. In the VALUE box, enter the Prompt ID that you saved in the text file for story 12345. If there is a linked story, enter nextstoryid in the FIELD box. In the VALUE box, enter the linked story code, for example: 67890. Choose Save. Repeat steps 5 to 10 for all stories that you want to call from your dynamic prompt. 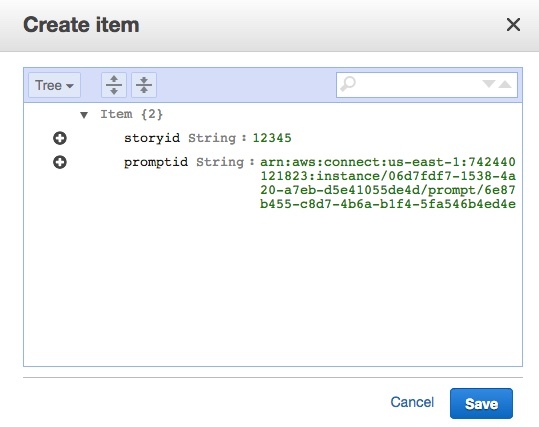 Next, create an AWS Lambda function to dynamically fetch the recording for the story requested by the caller. 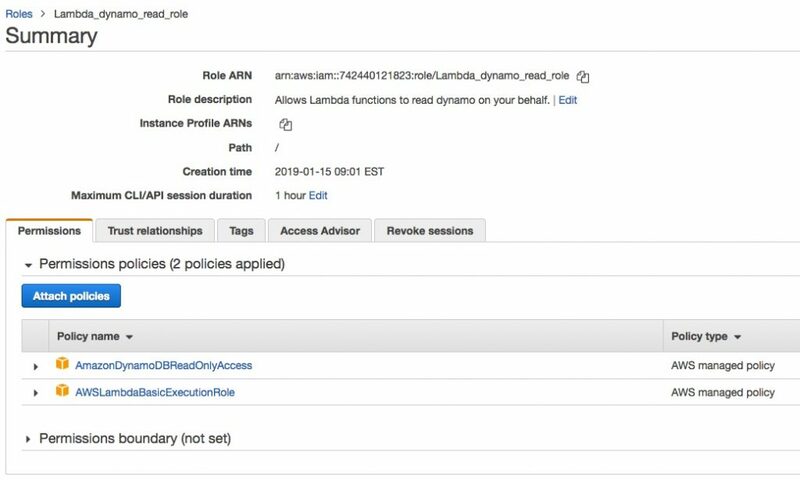 In the Lambda console, create a new AWS Lambda function with the right permissions to read Amazon DynamoDB. This means that you need to assign the appropriate IAM role. For more information about proper permissions, see the AWS Lambda Permissions Model documentation. The function uses Python 2.7 as Runtime. After the function is created, paste the previous code into the code panel, and choose Save. An initial menu in which the caller can choose the story to listen. An invocation to the AWS Lambda function created in the previous section. Eventually the dynamic prompt that will play the correct recording. The second contact flow informs the callers about the options available to them after they listen to the first story. 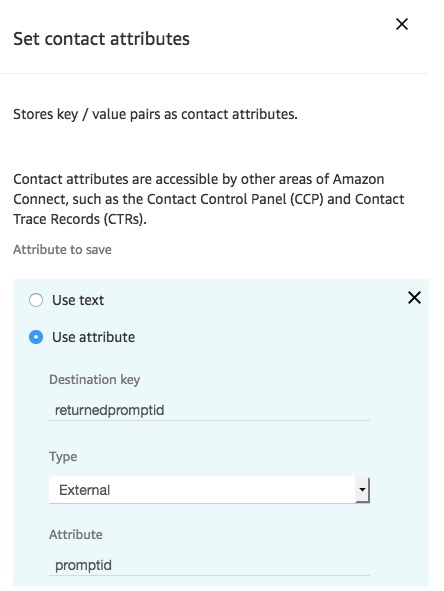 Open Amazon Connect, and choose the instance that you have previously created. 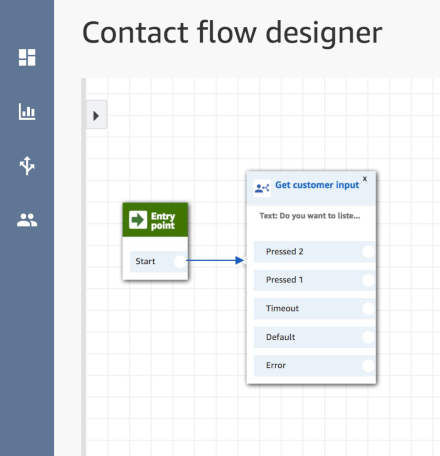 In the left pane, choose Contact flows. 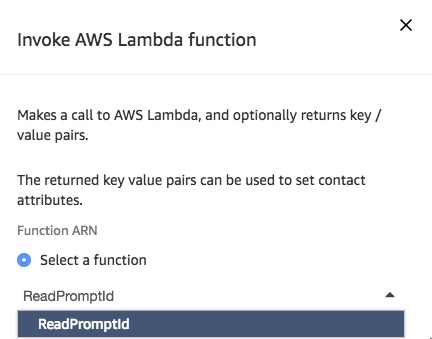 In the AWS Lambda section, choose the function that you created (ReadPromptID) from the drop-down menu, and choose Add Lambda Function. 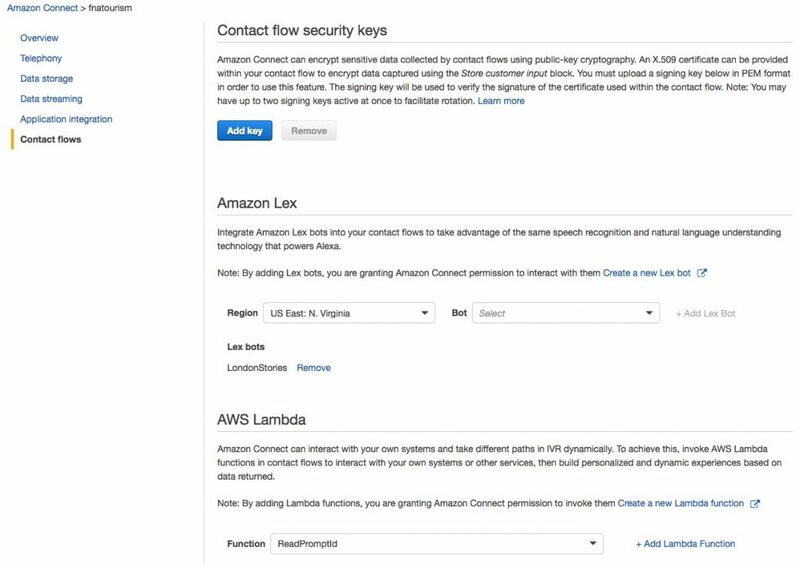 Your Amazon Connect instance now has the permissions to invoke your AWS Lambda function. Log in and let’s start building. 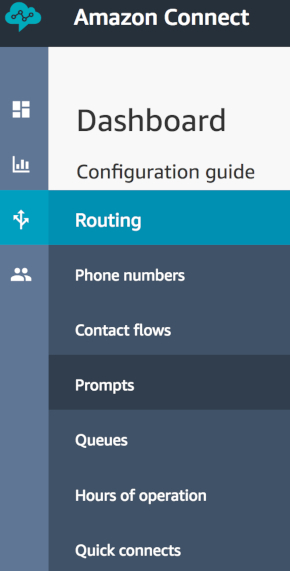 In the left pane, choose Routing, Contact flows, Create contact flow. Drag and drop in your flow the Play prompt block from the Interact palette. Choose the title of the Play prompt block to open the setting for the block. In this case, you do not use a pre-loaded audio file. 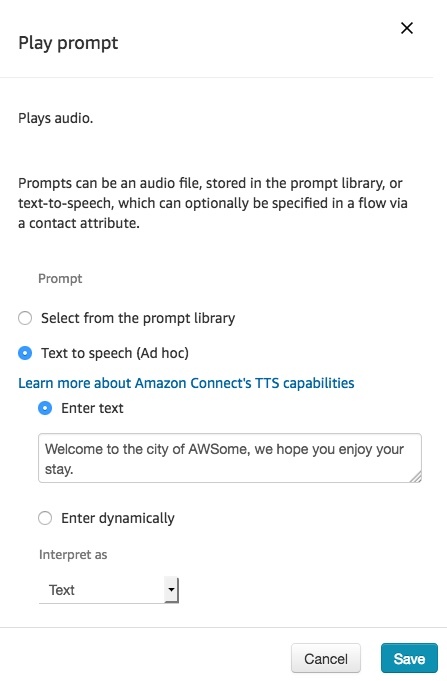 Instead, the Amazon Connect integration with Amazon Polly, AWS text-to-speech service, is used. Now that you have welcomed the caller, you need to ask which story they want to listen to. You need to check whether they have already listened to one story and asked for the next. To do so, use a contact attribute to store the contextual information. Add a Check contact attribute block from the Branch section. Open the setting for the Check contact attributes block. 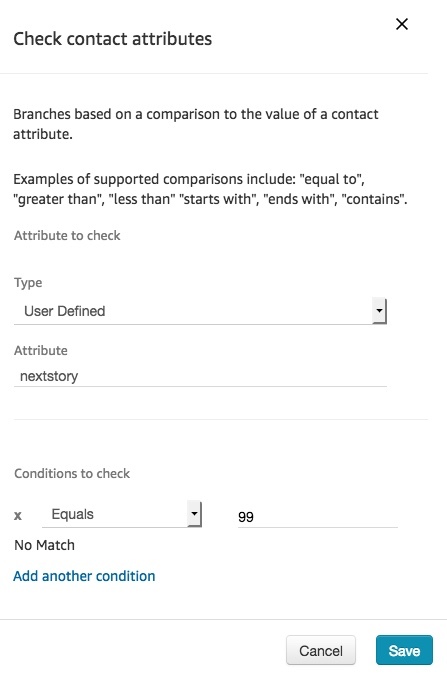 In the Type drop-down menu for Attribute to check, choose User Defined. In the Attribute text box, type nextstory. Choose Equals, and enter 99. Choose Store customer input from the Interact section. Connect the new block to the No Match branch of the Check contact Attributes block. Choose Custom, with Maximum Digits set to 5 and Delay between entry set to 3, in the Customer Input configuration. Add the Invoke AWS Lambda function from the Integrate section. 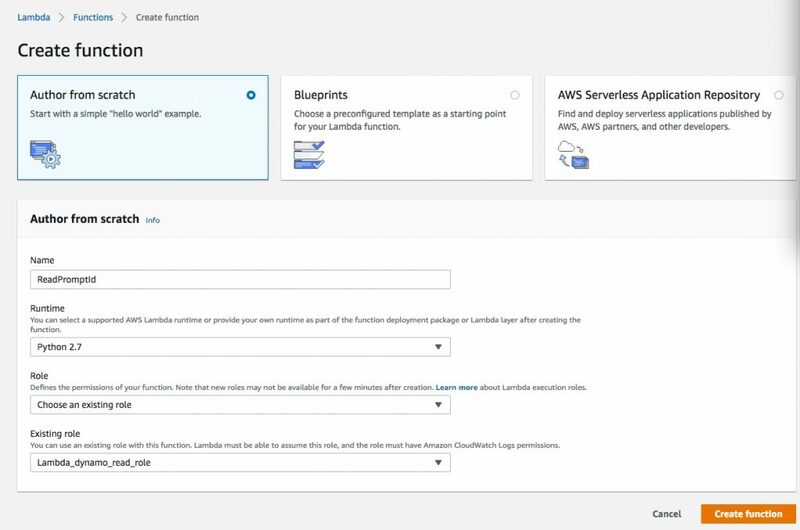 In the Invoke AWS Lambda function setting, choose Select a function. From the menu, choose the name of your Lambda Function. Connect the Error branch to the Play prompt to gracefully disconnect the call. 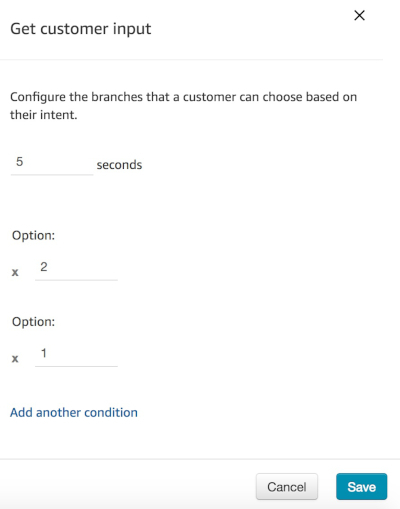 Connect the Success branch (successful flow) into a Set contact attribute block. Connect the first Check contact attributes block =99 branch to the Invoke AWS Lambda function. 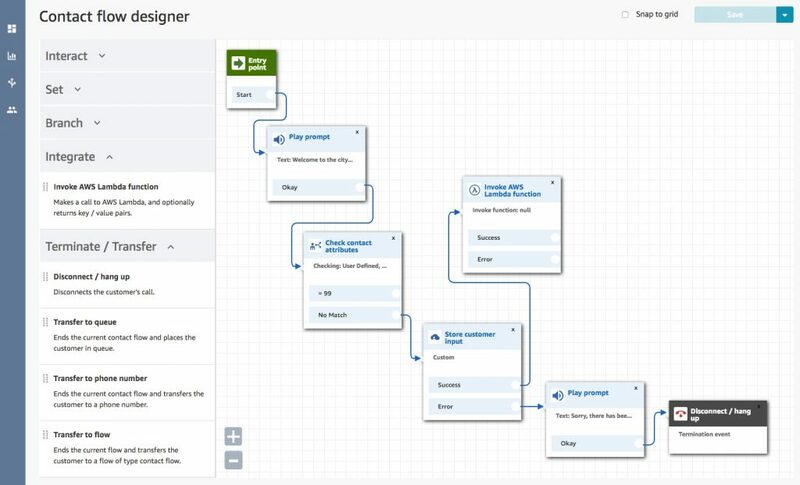 At this point, branch the flow based on the contact attribute returnedstoryid (use a Check contact attribute block). If it is =err it means the story code entered has no match in your table. Therefore, loop back and ask the caller to reenter the story code. For example, say “Sorry, I could not find the story requested. Could you please try again?” Otherwise, play the recording that the caller dynamically selected. Open the block settings window. Choose Select from the prompt library, Select dynamically. Set Type to User Defined, and Attribute to returnedpromptid. Your contact flow is almost completed and ready to be used. For the moment, link the last Play prompt block to a Disconnect/hang up block. In this way, you are able to Save & Publish it. You need this step to complete your audio guide because you must implement a menu of follow-up actions for when the caller has done listening to the selected story. 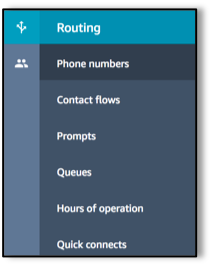 To keep the flow design efficient to read, create this menu in a different Contact Flow, named PostReadStoryFlow. Later, you transfer the call from the initial flow to this one. Press 1 or stay on the line (Default/Timeout) to listen to the next story. Press 2 to enter a different story code. “Press 1 or stay on the line (Default/Timeout) to listen to the next story. Press 2 to enter a different story code”. Leave the default Set Timeout. Add two options, labeled respectively 1 and 2. 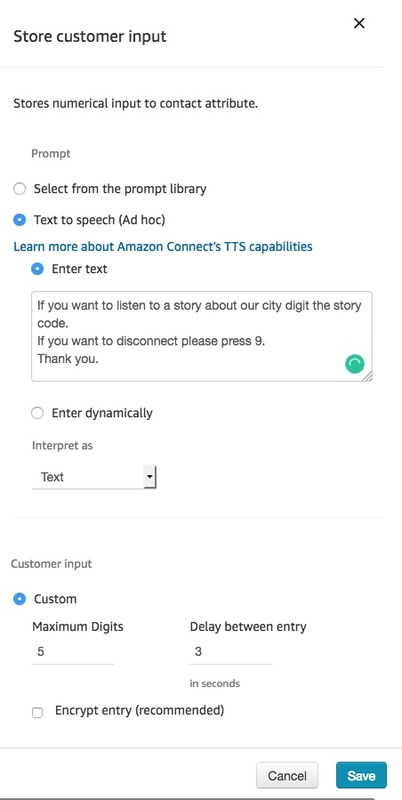 Set the contact attribute nextstory to the value 99 (listen to the next story) or 0 (listen to a new story), and then loop it back to the ReadStoryFlow with a Transfer to Flow. 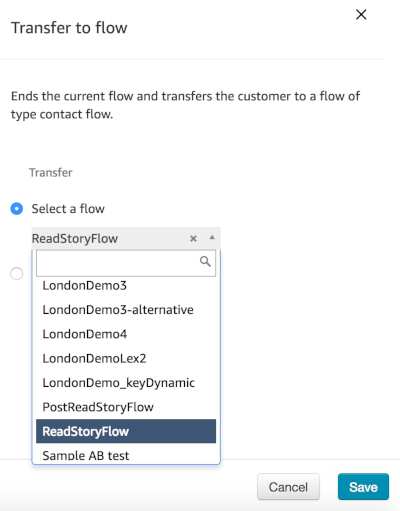 Open the Transfer to Flow settings, and from the Select a flow drop-down menu, select the ReadStoryFlow. In the ReadStoryFlow, delete the connection from the dynamic Play prompt to the Disconnect/hang up block. 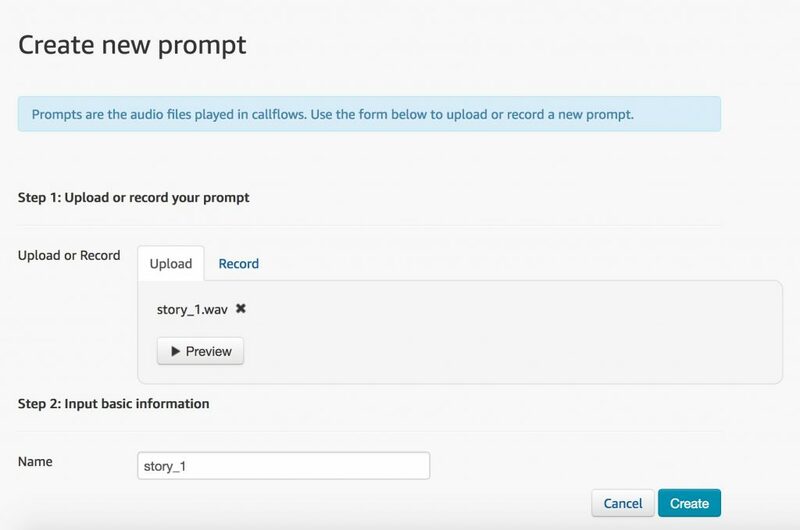 Instead, link it to a Transfer to Flow that you configure to use the PostReadStoryFlow, and republish the flow. Assign to it your new contact flow. Congratulations, you’re done! Your first audio guide application is live. Call your number and listen to the stories that you uploaded. Listen to your Welcome prompt. When prompted, enter on the keypad the five digits of the story code that you want to listen to. When the recording is fully played, choose the next story if you have linked stories. A new recording starts playing automatically. Instead, if you are curious to see how our system works, take out your phone and ignite your imagination. This first sign contains a telephone number (+ 1 844-865-7597) and 2 story codes: 1 and 2. Call and listen to the story. If you listen to story number 1, press 1, or stay on the line to automatically listen to story 2. Continue exploring. You will discover other signs. Each one has a story code (3, 4 or 5). Follow the instructions to listen to these stories. Press 9 when you want to disconnect. We hope you enjoy your virtual tour of our Cloud Contact Center. The solution that we built together in this post implements an audio guide without requiring a specialized device. Anyone with a mobile phone can listen to the recording. You can now use this solution in your own environment to let people listen to your content while walking through your museum or in the streets of your city. It was important that the system be straight-forward to set up, inexpensive to start and run over the long term, and comprehensive enough that students could upload new stories. It also had to be a comprehensive process to add new cities and locations when the time comes. This approach, with a few refinements, has met the needs of the first Canadian Hear, Here project, in London, Ontario in Canada. If cities in other parts of the world want to adopt Hear, Here, Amazon Connect can follow along. It is straight-forward and inexpensive to add new instances and new phone numbers. It is also easy to add new stories. After the system is set up and running, university or high school students, neighborhood associations, city heritage boards, or any other arts and culture venue affiliated with the project can collect new stories and upload them. If you would like to set up a Hear, Here project in your community, please contact Dr. Ariel Beaujot, Executive Director of Hear, Here. Before the project goes live, we do plan some other enhancements. 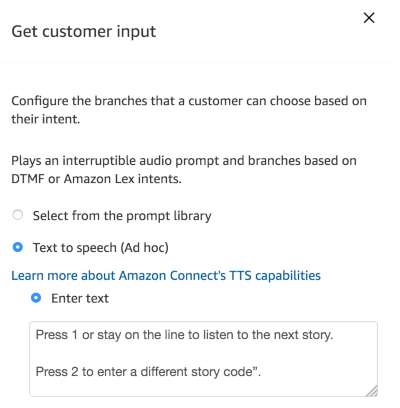 For example, moving to full conversation mode by integrating our contact center with Amazon Lex, the AWS chatbot solution. 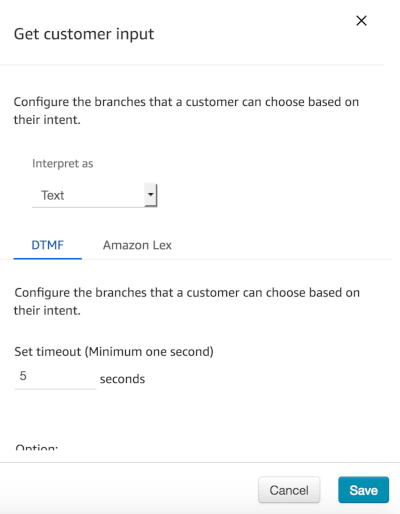 If you are interested in modifying your contact flow to take advantage of Amazon Lex, see the blog post by Randall Hunt, New – Amazon Connect and Amazon Lex Integration. Hear, Here London officially launches on Saturday, April 27, 2019 from 1:00 to 4:00 PM, at 255 Horton Street West, London, ON. Thereafter, the project will be available in London for all to view.